Last night, when I was going to switch off all the stuff in my shack, I saw an email from Malte, DE7LMS. I opened it and found a link to a video he recorded of my recent presentation in Weinheim. This entry was posted in Aircraft Scatter, Lecture and tagged 1296 MHz, 13 cm, 23 cm, 2320 MHz, Aircraft scatter, AirScout, Alpe Adria Contest, Amateurfunk, beacons, DB0LTG, dish, DJ5AR, DL2ALF, Doppler, Dwingeloo, EME, Funkamateur, GHz, International Space Station, ISS bounce, Let´s Bounce, Mainz, Microwaves, moonbounce, Parabolspiegel, SHF, UHF, UKW-Tagung, VHF, Weinheim on 2014-10-21 by admin. After my complainments about using the ON4KST chat in March Contest and the response I received from Claus, OZ1FDH, and Kjeld, OZ1FF, recommending the KST2ME tool, I added my homebrew prototype of a selective ON4KST client extension to my station control software. It communicates via telnet with the server. While working satisfactorily under normal circumstances, it was a desaster under contest load. When the software didn´t crash, it at least slowed down, by computing hundreds of posts in shortest time. Between 300 and 400 users have been logged to the microwave chat during contest time. During the first contest hours I tried to solve the problems with certain bug fixes, resulting in a huge loss of contest time. So I had to return to the classic style in using the web client of the chat. In total I logged 73 QSOs on 23 cm to 12 DXCC countries, spread over 39 grid squares (results). ODX was HG7F over 817 km. The use of the AirScout software, written by Frank, DL2ALF, has been essential. Most of the QSOs have been completed by assistance of aircraft scatter. A nice example is the one with DJ5BV in JO30KI. 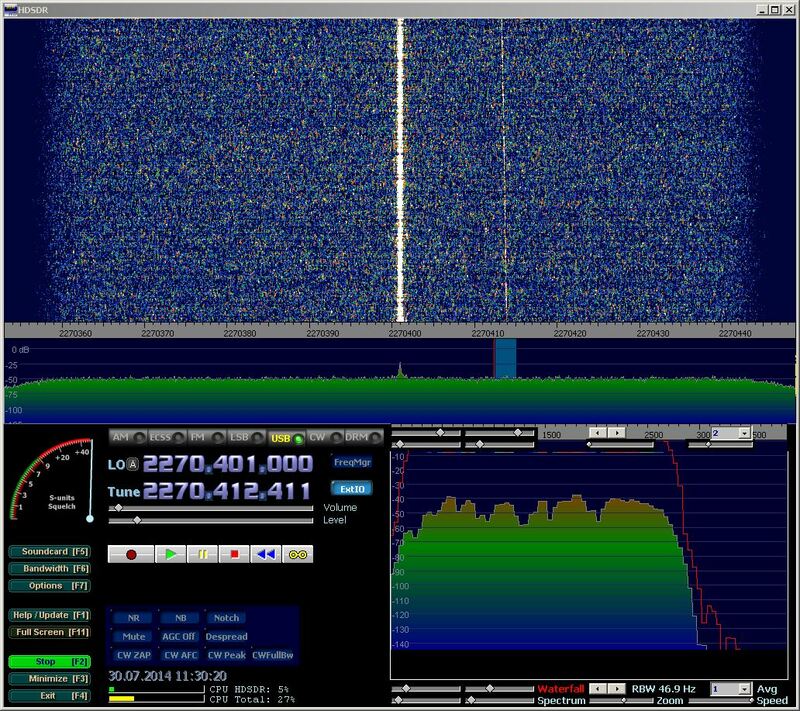 The distance isn´t really far enough to do it via aircraft sctatter, but it seems, both antennas were pointing west and that resulted in effects of aircraft backscatter with significant dopplershifted reflections. Dopplershifted reflections of Gerd, DJ5BV, caused by backscatter of aircrafts. This entry was posted in Contest and tagged 1296 MHz, 23 cm, Aircraft scatter, AirScout, Amateurfunk, DJ5AR, DL2ALF, Doppler, Funkamateur, GHz, Mainz, Microwaves, SHF, UHF on 2014-10-05 by admin. Jürgen, DK2AN phoned me tonight, to tell me, the new beacon DB0XY will be transmitting on 1296.910 MHz. It is located on the Bocksberg in the Harz mountains in JO51EU, about 750 m asl. The power is 10 W into a 4 times double quad, omnidirectional. The keying is in A1: callsign, locator, carrier, dashes, carrier…. In a first quick try it could be received here with 519 to 539 via tropo. When Planes crossed the path, the signal increased up to 559. Another beacon will be installed on 13 cm soon. The intention is to provide beacons for monitoring via aircraft scatter. Please spot any reception in the DX cluster. This entry was posted in Beacons and tagged 1296 MHz, 23 cm, Aircraft scatter, Amateurfunk, beacons, Bocksberg, DB0XY, dish, DJ5AR, Funkamateur, Harz, Mainz, Microwaves, Parabolspiegel, SHF, Tropo on 2014-09-22 by admin. September 13th, 2014 at the VHF/UHF/SHF Convention in Weinheim as a short version. September 27th, 2014 at the “Distriktsservicetag” of DARC districts K (Rhineland-Palatine) and Q (Saarland) in Saarbrücken. I will talk about how to surmount the horizon on VHF and up. After giving an overview over the classic propagation modes Es, Aurora, MS and Tropo, I will explain, how aircraft scatter and ISS bounce work. EME will be subjected too and the presentation will be completed by an introduction to “Visual Moonbounce” as performed by Daniela de Paulis. For the short version in Weinheim the overview over the classic propagation modes will be left out. This entry was posted in Aircraft Scatter, ISS Bounce, Lecture and tagged Aircraft scatter, Amateurfunk, Bodenheim, Clonbur, DARC, EME, Funkamateur, International Space Station, Inversion, ISS bounce, Let´s Bounce, Mainz, meteorscatter, moonbounce, Rheinland-Pfalz, Saarbrücken, SHF, sporadic E, Tropo, UHF, UKW-Tagung, VHF, Weinheim on 2014-09-01 by admin. 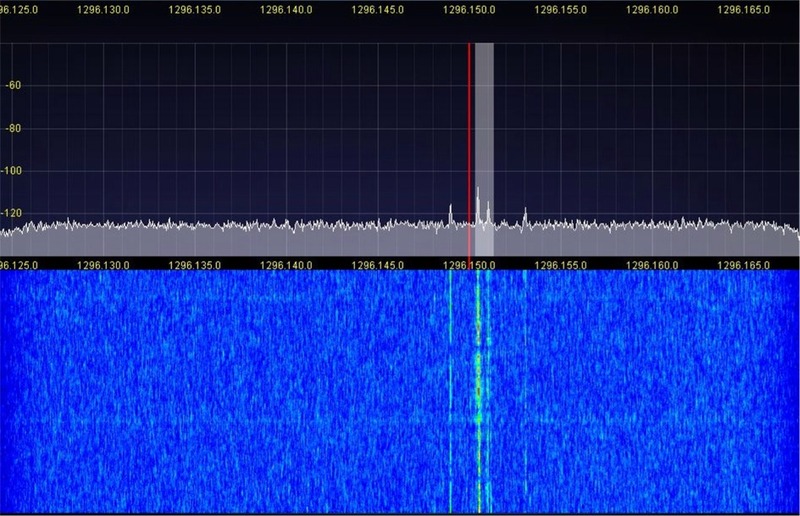 At present the HAM TV transmitter aboard the International Space Station performs blank transmissons until August 6th, 2014. No camera is attatched, so only signal levels can me measured. This was an opportunity for me to check out the FSTV-equipment, I set up during the last months. So my very first attempt last night was successful. I used the pass at 23:50 UTC on July 30th, 2014. I am looking forward to see some pictures in near future. This entry was posted in ARISS, ISS and tagged 13 cm, 2320 MHz, Amateurfunk, ATV, dish, DJ5AR, Funkamateur, HAM TV, International Space Station, Mainz, Parabolspiegel on 2014-07-31 by admin. On July 24th, 2014 on 19:00 CEST I will talk about how to surmount the horizon on VHF and up at the local DARC Club in Bodenheim near Mainz. This entry was posted in Aircraft Scatter, ISS Bounce, Lecture, Moon Bounce and tagged 1296 MHz, 13 cm, 23 cm, 2320 MHz, Aircraft scatter, AirScout, Amateurfunk, beacons, DJ5AR, Doppler, EME, Funkamateur, GHz, International Space Station, ISS bounce, Let´s Bounce, Mainz, Microwaves, moonbounce, Parabolspiegel, Rheinland-Pfalz, VHF on 2014-06-22 by admin. German Funkamateur mgazine has published my article “Abenteuer Bakenbeobachtung von 144 MHz bis 10 GHz” in its recent issue July 2014. As many topics are related to posts on this website, some of them are compiled here. Links to certain other websites can be found in the link list to the right. This entry was posted in Article and tagged 1296 MHz, 144 MHz, 2 m, 23 cm, 2320 MHz, Aircraft scatter, AirScout, Amateurfunk, beacons, DJ5AR, DL2ALF, EME, Funkamateur, GHz, Inversion, Mainz, Microwaves, moonbounce, Parabolspiegel, SHF, sporadic E, Tropo, UHF, VHF on 2014-06-22 by admin. Meteor Scatter: Back in Business! Since I will be back in Ireland in August, I plan to be QRV for the perseids on meteor scatter, activating my irish callsign EI8HH. The location is in Clonbur, Co.Galway, IO53HN. My equipment will be a FT-897 with 50 W into a 17 element yagi (F9FT) on 144 MHz. My last MS QSOs dated back to 1989, when high speed CW was state of the art. To gather some experience with WSJT and FSK441, I watched the 144.370 MHz and worked YO9MN and GM6VXB randomly. This entry was posted in Meteor Scatter and tagged 2 m, Amateurfunk, DJ5AR, DX, EI7IX, EI8HH, Funkamateur, GM4ZJI, JN49CV, Mainz, meteorscatter, VHF on 2014-05-08 by admin. The battle is over. I had my last QSO with Patrick, DH2PA on 70 cm just before the contest closed after seven days. There was a big regional activity on VHF, UHF and SHF, much more than last year. Finally I logged 414 QSOs on the four bands I have been active, compared to 266 in 2013. It is remarkable that there were many locals with improvised equipment on 23 cm. Just one new square on 2320 MHz could be worked during the activityweek: IK3GHY in JN65DM via aircraft scatter. But collecting new squares is getting harder and harder, the more are already worked. The tropo conditions remained normal during the seven days, so there was less DX than last year. This time I found four partners for 4-band-QSOs: DL7QY, DL8YG, DF5AY and DB6NT. Thank you all for your support and your patience! This entry was posted in Contest and tagged 13 cm, 23 cm, 2320 MHz, Aktivitätswoche, Amateurfunk, Contest, DJ5AR, Funkamateur, Mainz, Rheinland-Pfalz, SHF, UHF, VHF on 2014-01-08 by admin.